How touching! How compassionate was Gerald Ford! Ford also has the distinction of pardoning his presidential predecessor Richard Nixon, absolving him for any and all crimes Nixon may have committed while acting as president. Standard operating procedure: the potential or actual victims of Communism are worthy of American solicitude and the vigorous condemnation of their tormentors, while the actual, countless victims of U.S. aggression in North and South Vietnam, Laos, and Cambodia are worthy of no such concern (children in the south affected by Agent Orange, or children in the north made deaf by B-52 bombing, for example), and such American architects of their catastrophe as Nixon and Kissinger (among many others) walk and live free, wholly unaccountable. 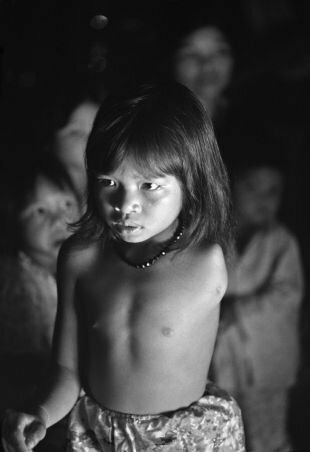 Quynh Lan, 11 years old, at her home in A Luoi, Vietnam. Her father was sprayed many times with Agent Orange. A review of Kathleen and Bill Christison, Palestine in Pieces: Graphic Perspectives on the Israeli Occupation (Verso, 2009). When several of us went to work with the International Solidarity Movement in 2003, my friend Pat Geier observed that her going raised the anxiety level of her friends in Louisville. Because she was headed into a possibly dangerous conflict zone, her friends began to pay more serious attention to what was going on there. That said, I can strongly recommend Kathleen and Bill Christison’s recent book Palestine in Pieces to anyone who has made a first trip to Palestine as well as to those people who’ve had their anxiety and awareness raised by such travelers. For example, I think of Matt Miller and Nima Sheth who spent a week on the West Bank in 2008 and a day in Gaza in 2009; Kelly McBride who visited the West Bank for three days in 2009; and J’Ann Allen and Sandra Tamari, who just returned from Cairo where they and 1400 other internationals had gathered to march to Gaza. I’m guessing that each of them knows at least a score of people who were made more aware of the injustices the Palestinians face daily. Join us for this discussion on Tuesday 23 March at CTSA, 1077 South Newstead in Forest Park Southeast. From my friend Andrew Wimmer…. I’m writing to invite you to a gathering at CTSA on Tuesday evening, March 23, at 7 PM. 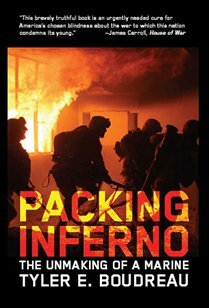 Tyler Boudreau, a former Marine captain, whom I met in the summer of 2007, will be joining us to discuss his book, Packing Inferno: The Unmaking of a Marine. Tyler commanded a Marine unit in Iraq in 2004 and resigned his commission after returning to the U.S. In the summer of 2008 he traveled to Jordan with another former Marine to work with Iraqi refugees, and this past summer he made a solo cycle trip from the west coast to his home in Massachusetts on his “long journey home,” speaking with groups all along the way. I’ve entitled this evening, “The Unmaking of a Marine, The Unmaking of Us,” because I have learned during the course of my friendship with Tyler a lot about the disengaging, disentangling, and unmaking that so many of us are engaged in. I think the conversation will be a particularly good one for us as we grapple with the hard questions of “where now?” in the face of escalating warfare after longs years of activism and resistance. I hope you’ll be able to join us at CTSA next Tuesday evening and bring a friend or two. The event is being cosponsored by Instead of War and the local chapter of Veterans for Peace.